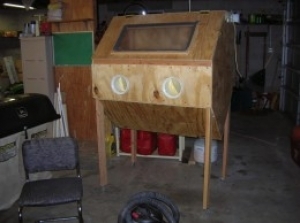 Homemade blasting cabinet made out of plywood and cheap parts. Plumbing fittings are attached for the air hose. Cotton-lined gloves are hose-clamped on to large PVC fittings. Viewing glass is a solid acrylic sheet. The entire box is sealed using foam weather strips and race tapes.